It is a momentous time in the history of our nation Nepal in the process of promulgating a new constitution 2015. The constitution of Nepal finally delivered on the promises of federalism. Not to spoil the party though, however, it is clearly apparent that half of the population in southern and other parts of Nepal is still agitated despite of a new constitution which still does not address the voice of marginalized group in Nepal. To bring things into perspective, I am talking about this half of population of marginalized group represented by Madhesi, JanJatis and Muslims. There is no doubt that the constitution is promulgated by the constituent assembly with a clean majority, something that can not be denied when the three largest parties have found a common ground. This has also made easier for the ruling coalition to oversee the marginalized populations voices to incorporate in the constitution. To make it worst, the marginalized population agenda bearer political parties have diminished representation in the second constitution assembly after their failure to agree on a constitution in the first term of the constitution assembly. One question asked by the wide diaspora of the population in north unaffected by the ongoing protests in south of Nepal is why Madhesi and Janajati are still protesting even so the fundamental demand of federalism is accepted. My attempt is to find reasonings on the increasing Madhesi Resentment against the constitution building process. Madhesi definition includes Madhesi political parties (many), their activists, extreme Madhesis, moderate Madhesis and scared indifferent Madhesis. There is an clear massive resentment among the Madhesis that may be categorized in two aspects – social and political. Protesters in Janakpur that includes oridinary Madhesis and activists of Madhesi Morcha is ongoing for more than 40 days. A disclaimer to all readers about this writing is that this piece depicts a Madhesi perspective. The writer’s interpretation of Madhesi resentment is with the government and leading national parties, but not with communal or ethnic group or any particular persons. Although, some arguments could make a no sense for a non-Madhesi, but I would ask all readers to hold any thoughts and continue reading to get a Madhesi perspective. Killings in Madhesh: Moderate and Indifferent Madhesi were not bothered until a point after a month-long aggressive political protest by the madhesi parties has been brutally suppressed by the government using security forces. In the process more than 40 people are killed. The majority of casualties and brutality begun after the Tikapur incident where 8 policemen were killed by the angry protesters. A heinous act by angry mob during a political protest cannot be justified in any circumstances. Without going to the political reasons of such a massive protest by Tharus in The Tikapur event, I would point out to the earlier clashes in Madhesh that begun from the day one when the draft constitution feedback process was initiated by the government. In some places like Janakpur, police resorted to crowd control measures of baton charges resulting in several injuries including child, women and old people. This followed by two civilians killed in Surkhet, one killed in Rautahat, 5 civilians killed in Rupandehi, 1 killed in Karnali and 1 killed in Gaur with total 10-11 protesters killed before the Tikapur incident where the angry mob retaliated to the crown control and indiscriminate killing resulting in policemen casualties. Tikapur incident was followed by army deployment, looting and burning of Tharus houses amidst curfew and intolerant measures by the security forces of Nepal police and armed police force. Further, 1 civilian bystander was killed in Rautahat, 4 killed in Birgunj, 8 killed in Jaleshwor, 3 killed in Janakpur and 4 civilians killed in Bhairahawa by the security forces with one casualty from the security force. The total causalities run around almost three dozens in the name of suppression of any protests against the new constitution. The Madhesi obviously get this as deliberate killing of their people all across the Madhes despite the government’s argument about crowd control and violence caused by the protesters. This has swollen the number of Madhesi participating in the protest exponentially, essentially taking the political parties out in terms of leading the protest. Today more than 95 % of Madhesi support the cause of Madhesi Protests. National Human Rights and International Human rights have alluded to the fact that Nepal Security Forces have used excessive force to control the protest mentioning that often resorted to live ammunition easily with an intention to kill. This article will not go into grizzly killings of Madhesi and policemen, but, certainly uncontrolled killing of Madhesi people is seen by the Madhesi as a genocide or ethnic cleansing. This is the sole reason all Madhesi all across the nation are protesting the bloodshed ushered by the security forces in Nepal while the rest of the country was uplifted in the mood of promulgating historical constitution. One of the major anger among madhesi is that the government spokesperson never backed up from their position on suppression, use of excessive force and killing of civilians at all. This was infuriating. The prominent Nepali mainstream News Media outlets role stood up in rejection for Madhesis if not silent played a detrimental role in the psychology of Madhesh while the bloodshed was in the full swing. The ruling party leaders and media has attempted to justify the killings so far. This is a clear misrepresentation of the Madhesi protest. In several cases, children were brutally shot dead in the name of protest after they were taken into control. The leaders of UML also publicly used derogatory tag line ‘Dhoti’ openly in an interview and in other instance the future prime minister KP Oli referred to people killed as mangoes bound to fall from a tree which will not make any difference to the country. This simply undermined the aspirations of madhesi community and outraged extreme to extremist, moderate to extreme and indifferent to actions in the period of a month. To make the matter worst, occasional outburst by the national leader claimed that the madhesi diaspora is basically from India and are not Nepali citizen at all. Even though madhesi looks like Indians across the border, madhesi are Nepali. This is an insult to the Madhesi dignity who always have to fight for its identity. An identity crisis is looming over everyone in Madhesh. 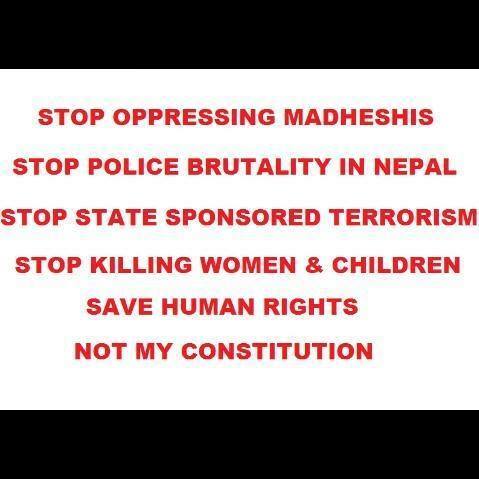 Slogans in the social media against the Nepal Police brutality that claimed more than 40 lives. The political resentment among Madhesi is because of the rising political awareness among madhesi. Although, none of the madhesi have any trust on the leaders as any Nepali would do. Madhesi including Tharus represent about 40-50 % of population of Nepal. With the new constitution Madhesi are looking for the equal representation in the state government and central government. There has been serious allegations made by madhesi leaders of an attempted division of madhesi and tharu clusters which would limit Madhesi political representation. As a marginalized group, Tharus in the west are combined together with hilly areas separated by geographical boundaries. A fear among them is because of parsimony and gerrymandering, their representation will be seriously flawed in future. Similarly, Madhesi in eastern districts of Sunsari, Morang and Jhapa are excluded from the central Madhesi province. Madhesi seek for one or two state encompassing their big cluster based on their settlement. Further arguments and debates can be made on the structuring of states, however, it is a critical practice in democracy and federalism to keep the minority cluster together to increase their political representation. Gerrymandering to benefit minority voters has been an integral part of the legislative redistricting process throughout the United States ever since the adoption of the Voting Rights Act of 1965. The contrary is happening in Nepal. Out of 20 southern districts in Terai Madhesh, only 8 districts are included in one Madhesi state. The remaining 12 are included in 5 other states with majority of hill based people. This would diminish already marginalized Madhesi representation in future which is a major cause of discontent among Madhesis. Beyond that, Madhesi leaders and intellectual raised a serious issue of proportionate representation principle where the constituency for the central government are divided based on geography instead of population. Out of 165 , 100 constituency are allocated among the hill territory and 65 in the Terai Madhesh. Further proportionate representation seats of 110 is added. Madhesis are against the proportionate representation principle in a belief of the fundamental practice of democratic elections elsewhere in the world. Madheshi and Tharus are commonly people in Southern belt of Nepal including hundreds of different ethnicities and castes brought together by similar culture and language. Madhesi aspires to preserve its identity as Madhesi in the federal Nepal where their languages and culture will be promoted as a federal state identity along with other prominent languages and Nepali. A Madhesi will ask why there is not proportionate representation of Madhesi in Army, Police and Armed Police Force. Why there is not proportionate representation in Government ? Partly, answer to the lack of representation in Government service is the obvious difficulty of madhesis to get up to speed in Nepali language as a non-Nepali speakers. This applies to all other ethnicities represented as indigenous population – Janjati . There is an argument made by some people that Madhesi are not discriminated in government position sighting appointment of Madhesi President and Vice President. The answer to that is the mere Tokenism can not solve the issue of proportionate representation. A President and Vice President do not have any executive power except to protect and abide by the interim constitution. In future, however, President have significant power as commander-in-chief of army and several other functions as indicated by the draft constitution. This is an uphill political fight for Madhesi diaspora against the government to push the agenda for equality in the new promulgating constitution. This is not a communal protest against any particular ethnicity or particular person. The government and leadership in the status quo has, however, attempted to make the agendas of Madhesi as communal and bring a split between Hill based people and Madhesi which is simply not the case. It cannot be denied, however, that there are elements in the both sides who are deliberately instigating communal issues to dilute the real agenda for justice and equality for Madhesi and JanaJati. I hope that with just that in mind, there are plenty of Abraham Lincoln’s and Luther Kings who are supporting the case for resentment with the institutionalized discrimination against the marginalized madhesi and Janajati. With hope for a common ground between protesting Madhesi and the government and with the prime hope of end in violence, I would pray for Peace and Unity among all language speakers in Nepal. ← Invitation: Nepal invites CA representatives to celebrate back home.